Results may occur at 2 months. Not intended for frontal baldness or a receding hairline. 5% Minoxidil Topical Solution. Factory Sealed Fresh Boxes! Results may occur at 2 months. Not intended for frontal baldness or a receding hairline. Male pattern baldness is responsible for the vast majority of male hair loss. More than 95% of male hair loss is due to male-pattern baldness, a genetic trait. Tugain 10% Solution Cipla Hair Loss Baldness Regrowth Promoter For Men HLK, ..
5% Minoxidil Topical Solution. Information Booklet on How To Use and Obtain Best Results. One Child-resistant Dropper Applicators. Trending at $18.81eBay determines this price through a machine learned model of the product's sale prices within the last 90 days. Morr F 5 % Hair Regrowth DHT blocker FDA approved. Manufacturer: INTAS Pharmaceutical. Mfg Dec 2018. Form: Solution. 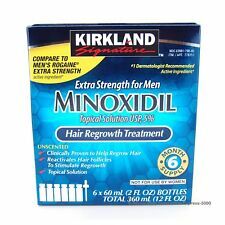 EXTRA STRENGTH Minoxidil 5%. by Kirkland Signature. Treat general thinning of hair on the top of the scalp. Dry, itchy scalp and irritation may occur. EXPIRATION DATE: 04/2020. Continued use is necessary to increase and keep your hair regrowth, or hair loss will begin again. It should only be applied directly to the scalp area. This is normal and is a sign that Tugain is working.Take care that Tugain does not trickle down onto your face as it may cause undesirable facial hair growth.The amount of hair regrowth is different for each person. It works by encouraging hair follicles that have stopped producing hair to begin making new hair and inhibit the natural hormone DHT from forming. excellent job of inhibiting DHT, and a lot of people consider it the best. 12 boxes of Kirkland Signature Extra Strength for Men. 12 boxes of Kirkland Signature Extra Strength for Men. . Condition is New. Shipped with USPS First Class Package. 4.5 out of 5 stars - 12 boxes of Kirkland Signature Extra Strength for Men. 2,070 product ratings2,070 product ratings - 12 boxes of Kirkland Signature Extra Strength for Men. 4 Pack Morr 12.5% 60ml Hair fall Control regrowth treatment for Men.